After its seasonal closure in June, Chilliwack/Vedder River reopens for fishing on July 1st and there are several different fishing opportunities throughout July and August. The main fishery which anglers focus on is the summer red chinook salmon fishery, while catch and release is another option for sockeye salmon that are heading to Chilliwack Lake. Trout, char and whitefish can also be commonly caught with light tackle. 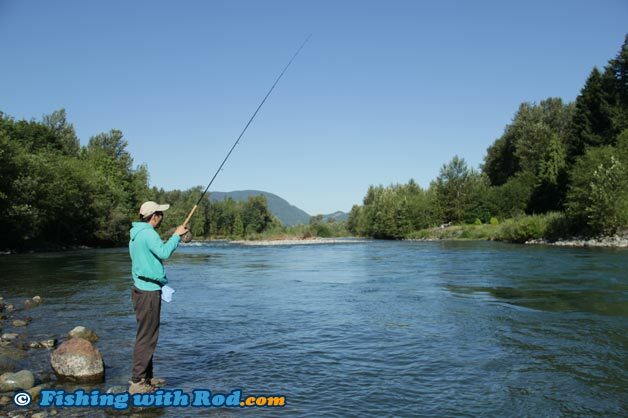 Being able to fish in shorts and T-shirts, and take advantage of the long daylight hours makes summer fishing in the Chilliwack River very enjoyable. Here is an overview of this fishery. The primary target species in July and August is chinook salmon. These red chinook salmon are once introduced and sustained by Chilliwack Salmon Hatchery. They are typically smaller than the fall white chinook salmon found in the same system. Average size fish are between 5 and 15lb. Fishing for these chinook salmon is usually good throughout July and tapers off in early August as they start spawning. Throughout July, sockeye salmon can also be found throughout the system as they make their way up to Chilliwack Lake. Retention of these fish are closed, but fishing for them is permitted. These fish are fantastic fighters for those who enjoy catching and releasing. Rainbow trout can be found in high abundance throughout the Chilliwack River in the summer. Beside the resident larger rainbow trout, you will find plenty of smaller fish which are in fact juvenile steelhead which are released by the hatchery every May. Most of these fish are expected to make their way into the ocean and return as adult steelhead several years later. A small percentage of the fish often become resident trout, which can have negative impacts on native resident trout and juvenile salmon by competing or predating on them. Due to these concerns, anglers are permitted to keep these trout, which can be identified by the absence of their adipose fin. There is a daily quota for these fish, so please check the regulations. All wild trout and char have to be released with care. Because there are both species that you can keep and cannot keep returning to the Chilliwack River at the same time, it is important to know how to identify all five species of salmon. Chinook salmon have small spots across their back and small spots across their entire tail. Their gum is black and the edge of their jaw is white. Adult chinook salmon are defined as over 62cm and are required to be recorded on your licence when you choose to keep one. Although sockeye salmon cannot be retained on the Chilliwack River, it is important to know what they look like so you do not kill one by accident. Sockeye salmon that are returning to Cultus Lake are endangered and their recovery depends on your assistance. Sockeye salmon are typically spotless and silver until they are near the spawning ground. At spawning stage, their body colouration is red while their head turns green. Some Cultus Lake sockeye salmon are hatchery marked, which means they also do not have an adipose fin like a hatchery marked coho salmon. It is important that you do not confuse the two and kill a sockeye salmon by accident. The techniques employed for targeting summer chinook salmon can be slightly different than how you would target fall salmon species in the Chilliwack River. Because river level can be quite low in the summer due to the lack of rain, there are usually less fishing spots available as most sections of the river are too shallow to hold fish. Chinook salmon tend to look for deep spots, so focusing your effort in deep pools and head of runs where fish are more likely to be found can improve your success. Fishing also tends to be best early in the morning, or late in the evening just before dark. The most common method used is float fishing with freshly cured roe. For more information on how to properly set up your float depth, please read Float Depth Adjustment for River Fishing. Most anglers believe that sockeye salmon do not bite once they enter rivers, which is incorrect. When sockeye salmon are found in Chilliwack River, bait including roe, krill and shrimp can trigger these fish to bite. Their bites are often very subtle, so a more sensitive setup works best. Once hooked, sockeye salmon are very acrobatic. Because only catch and release is permitted for sockeye salmon, please handle these fish with care by keeping them in the water and releasing them quickly. Rainbow trout found in Chilliwack River are not very big, so an ultralight spinning rod rigged with either a small lure or a float fishing rig can produce fish all day. This is the ideal fishery for kids. If you are camping in the area, definitely give it a go if there are children in your group. For those who are looking for a challenge, then dry fly fishing with a 3wt can be very entertaining and rewarding when you trigger a rise or two. The Chilliwack Vedder River is long. Some say it gets crowded, but the truth is only certain spots become congested. To have a good experience, it is best to avoid the busy spots. Busy spots are usually visible ones that can be accessed easily. These include Keith Wilson Bridge, railway bridge, Lickman Road, Peach Road, Vedder Crossing, Tamahi, Alison Pool. By going to a spot where less people are fishing, the likelihood of you hooking into some quality fish is bigger since the fish are not spooked. Surprisingly, you can usually find a nice quiet spot by taking a very short walk from one of these busy spots, even on weekends. Finally, this river is one of the busiest recreational corridor in British Columbia, therefore issues such as user conflict and garbage can ruin anyone's experience. By sharing your waters with other anglers, kayakers, rafters and other recreational groups, you can ensure everyone has a safe and enjoyable trip. Please don't forget to bring your garbage with you when leaving.